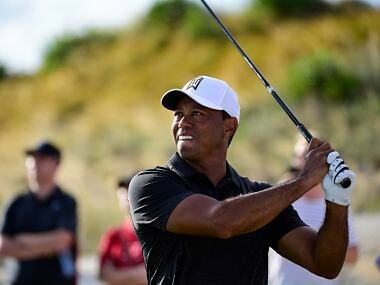 Miami: Tiger Woods' hopes of a fairytale return faded on Saturday after an error-strewn round saw him tumble down the leaderboard at the Hero World Challenge in the Bahamas. After solid displays on his opening two rounds had left him at seven under par for the tournament, the former World No 1 suffered a torrid third round with a three-over-par 75. It left the 14-time major winner at four under, 10 shots off the lead held by American Charley Hoffman on the par-72 Albany Golf Club course. Hoffman countered two bogeys and a double-bogey with six birdies in a two-under 70 and a 14-under total of 202. American Jordan Spieth and England's Justin Rose were tied for second five shots back, Rose after a one-under 71 and Spieth with an even par 72. Woods, who is playing for the first time since February, was in trouble from the opening hole, hitting his tee shot at the first into the sand bordering the fairway. His second shot hit a rock hidden in the sand, leaving him with a difficult up and down to save par. He reached the green in three but missed the putt to make bogey. A further bogey followed on the third when an attempted chip onto the green struck the bank and rolled back. Two more bogeys on the sixth and seventh put him four over for the day as his challenge threatened to unravel, and a further bogey on the 10th further deepened the gloom. But Woods kept battling away and finally started getting some joy from his putting, to finish with two birdies on the 14th and 17th holes to claw back two shots. After rolling in his putt at 14, Woods doffed his cap and gave fans a little bow. "It's ridiculous, it took me 14 holes to make a birdie," he said. "At that time I've already played four par-fives and nothing happened. But, hey, it's just one of those days ... tomorrow is another fight. "You've got to keep fighting, and that's one of things I've always done in my entire career is just keep fighting and try to post the best number I possibly could," Woods added. "Today it was a lot, unfortunately. It just ended that way." A further birdie putt on the 18th rolled agonisingly wide and Woods said he didn't think he had major adjustments to make to improve in the final round. "I really didn't feel like I was that far off, that's the crazy part," he said. 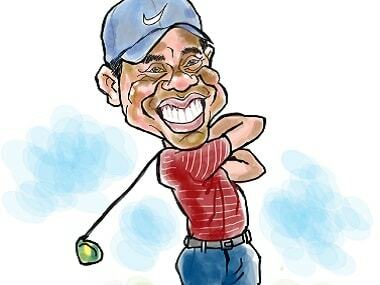 Woods' return this week in the 18-man tournament which benefits his charity is his first event since back surgery in April. The golf superstar has made only a handful of appearances in the past two years after back problems forced him to miss the entire 2015-2016 season and despite the frustrations of Saturday's round Woods said he was enjoying his return. "It feels good," Woods said. "It feels good to be out here fighting again. I've missed the fight. I've missed doing this."